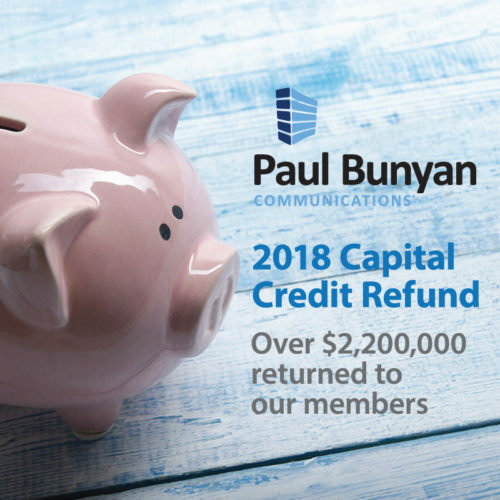 Over $2.2 million has been returned to members of Paul Bunyan Communications through the 2018 Capital Credit Return! Paul Bunyan Communications is a not for profit company that strives to provide the highest quality service at the most affordable rates. As a cooperative, membership in Paul Bunyan Communications includes the opportunity to share in the financial success of the company. When profits are earned they are allocated to the members based on their proportional share of the allocable revenues. These allocations may then be returned to the individual members through capital credit retirements. “The state of our cooperative is very strong with over 22,000 members throughout our 5,500 square mile service territory. We have been very busy building one of the largest all-fiber optic rural Gigabit networks in the country, the GigaZone, which is revolutionizing the way members live, work, and play. It is rewarding to see all those efforts continue to pay off and return these profits to our membership” said Gary Johnson, Paul Bunyan Communications CEO/General Manager. “For over 60 years we have been providing the latest in technology at cost. There is no membership fee to join Paul Bunyan Communications and there are no annual membership dues. All you need to do is subscribe to either one line of local phone or Broadband Internet service and you become a member. You get the latest in technology backed up by our talented team of over 130 local employees that all live and work here” added Dave Schultz, Paul Bunyan Communications Chief Financial Officer. “In a highly competitive industry with national competitors our cooperative has been successful because we put our region and our members first. Our investments go here, back into our network, our services, and our communities.” added Brian Bissonette, Paul Bunyan Communications Marketing Supervisor. If you were a member of the cooperative in 2002 and/or 2017 and accrued more than $10 in total capital credit allocations, but do not receive a check by October 22, please contact Paul Bunyan Communications at (218) 444-1234 or (218) 999-1234.